I have just returned from a trip to the beautiful Seven Lakes region of southern Argentina which encompasses the popular ski resort of Bariloche. Unfortunately, Villa La Angostura, one of the loveliest little towns nestled between the lakes and the mountains, is buried under ash. I could barely see the sky, let alone the blue waters of the lake. I saw residents walking around with face masks and it is impossible not to be covered in ash yourself if you stand by the roadside while a car passes by. Ever since the Puyehue volcano (located on the other side of the Andes in Chile) began erupting a few months ago after nearly half a century of silence, life in the Seven Lakes area has changed dramatically for the worse. Bariloche airport was closed for most of the ski season (July-August) and remains closed even though the city of Bariloche itself does not have as much ash as Villa La Angostura. Some of the border crossing points between Chile and Argentina had been shut down, but as of last week, the main one to Villa La Angostura from Chile was open. 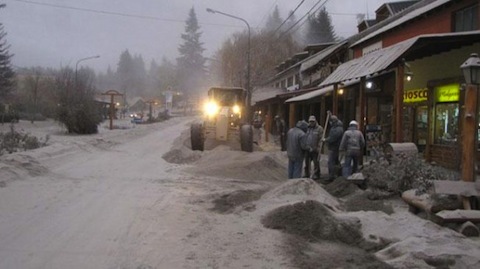 Many businesses in Villa La Angostura have gone under; plants and trees have died. Cattle ranchers have moved hundreds of cows to literally greener pastures. The ash constitutes a health hazard, especially to children and people who have weak respiratory systems. The northernmost and southernmost parts of the Seven Lakes are still habitable and wonderful to visit. San Martin de los Andes (north) and Llao Llao (south) were lovely to spend time in, however, whenever cars (and especially trucks) drive by, they stir up enormous clouds of ash along the roads, leaving drivers to deal with poor visibility and bystanders covered in fine dust. Because there were very few tourists, hotels have lowered rates quite dramatically. Even the most luxurious hotels have special rates. Of course, you never know if San Martin de los Andes and Llao Llao will get more ashes heaped upon them. I did see piles of ash cleared away from the roads in both towns but when I was there, the skies were clear (although gazing in the distance towards Villa La Angostura, I could see the ash clouds blowing over from Puyehue). Everything depends upon the direction of the wind. Villa La Angostura lies immediately east of Puyehue and the usual wind direction is eastward. However, from time to time, the winds can blow in the opposite direction, towards the Chilean side, causing airport delays and closures in Temuco, Osorno and even Puerto Montt (which are all in Chile). you seem to have great knowledge of the area. My husband and I are trying to decide between doing 6 nights at Estancia Puemma Hue or splitting up our time between Design suites (less $$) and a two night splurge at Llao llao. What are your thoughts on ash and also just general location and loveliness!? Sorry to be contacting you out of the blue but we are coming from Hawaii and totally overwhelmed with all the choices and info! I suggest splitting your time between Llao Llao and Design Suites. There is little ash in Llao Llao, Bariloche and San Martin de Los Andes but Villa La Angostura is terrible. Stay in Llao Llao. There is enough to do there. In Calafate, go to the Perito Moreno glacier. Dear Esme: We are considering a two years appointment in Bariloche, starting Feb. 2012. Do you think the ashes will be cleared up by that time? Any advice? Thanks. You asked whether in 2 years the ash cloud would still affect Bariloche. I have no idea. The Puyehue volcano has a mind of its own. However, Bariloche is not as badly affected as Villa La Angostura and life goes on in Bariloche. People don’t have to wear face masks in Bariloche. Bear in mind that there is ash on the streets so when the cars and buses drive by, they stir up a lot of ash and if you are walking along the road, you will have a thin coating of ash on you everyday. Looks almost like wintertime. You can see some amazing pictures of the eruptions here — take a look its worth it. We spent a lovely holiday in this area back in 09, it’s very sad to see it this way as they are totally dependent on tourism. It’s a beautiful region.